Workplace wellness programs appear to have a massive financial benefit that has just been discovered. Publicly traded companies that have award winning wellness programs out-perform the stock market by a huge margin. Three studies that are hot off the press demonstrate that publicly traded companies with best-in-class workplace wellness programs have better stock valuations than the Standard and Poor’s stock index. A portfolio comprised of award winning companies would be a dramatically better investment. Before I get into the details, here is a little perspective. There are thousands of mutual funds all of which invest in several companies that balance risk while seeking to maximize return for investors. Another way to invest is to purchase individual stocks in each of the 500 largest companies. These 500 companies make up the Standard and Poor’s 500 Index. Rather than hunting for bigger returns by investing in companies that look promising, this investment strategy buys stock in all 500 companies. This strategy is called index investing. Over a one, five, and ten year period very few mutual funds perform better than the S&P. Over a 15-year period, the index has an average return of about 11% per year. Not too bad. If, during that same time period, you had invested in companies who won the Koop Award for offering an outstanding workplace wellness program, you would have earned over 26% per year. In essence, your money would have doubled every 3 years. I am a long-term member of the board of directors of the Health Project. Each year we review wellness applications for the C. Everett Koop National Health Awards. To win the award employers must describe their wellness programs in great detail. Our job is to identify the award winners based on a rigorous review of each program based on participation rates, and the improvements in employee health and medical cost savings. In this study, the investigators tried to answer the hypothetical question: what would happen if you bought stock in the Koop Award winners during the month they won the award. 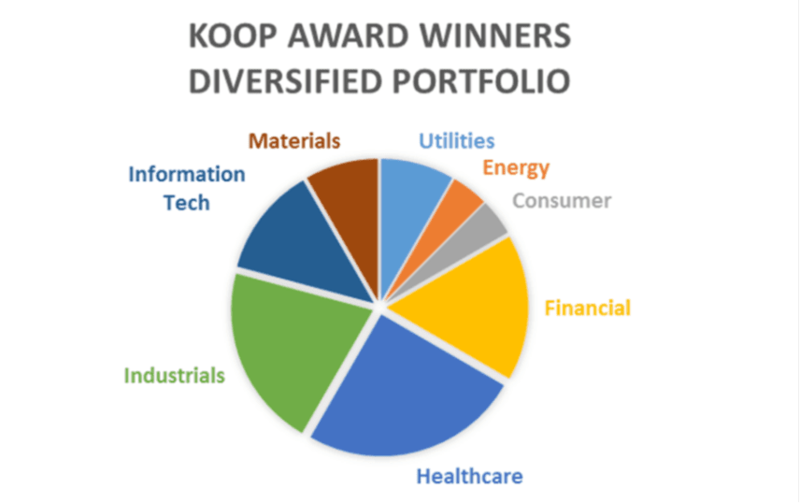 Over a 14 year period, there have been 26 publicly-traded companies who won the Koop Award. If you want the exact details of the study methodology, you can read the paper here. Here are the results of this study. 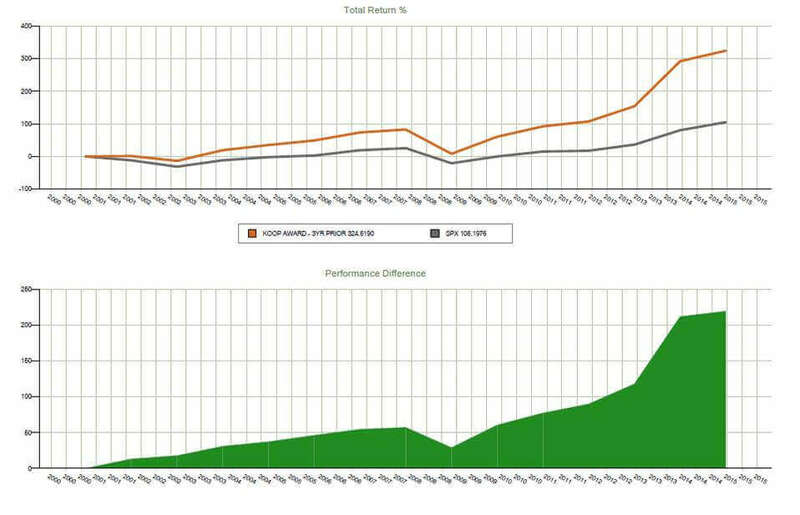 The orange line shows the total percent return on investment for Koop Award winners from the time the award was made. The grey line is the total return of the S&P 500. The second graph shows the cumulative advantage of the hypothetical Koop Award portfolio. When I first saw these results I was skeptical. I have watched too many episodes of American Greed so my “if it sounds too good to be true…” reflex kicked in immediately. I had warning bells sounding everywhere. My first thought was that any investment that grew at 26% per year is either a Ponzi scheme or a once-in-a-lifetime investment opportunity. Most likely it would be a Ponzi scheme. As an experienced investor, I must admit that this study proves absolutely nothing. It is not a randomized clinical trial. It is a retrospective study, that at best, can only suggest an association between companies with wellness programs and their stock performance. But it does raise a provocative question — was this just luck or is there really something about successful companies that just happen to have good wellness programs? Certainly there other publicly traded companies that also perform well but don’t have wellness programs, right? If this were the only study with these results, I would have probably dismissed it as an academic exercise in retrospective stock picking. But in the same January 2016 issue of the journal JOEM, there was even more evidence. Each year the American College of Occupational and Environmental Medicine (ACOEM) gives out the Corporate Health Achievement Award (CHAA) to the healthiest and safest employers in North America. Applicants for the CHAA are judged on 17 standards in four general categories: leadership and management, healthy workers, healthy environments, and healthy organizations. Employers submit applications that describe each of these areas and a panel of experts award points based on the information provided. Using a similar study design, employers from publicly-traded companies that had high CHAA scores were included in a hypothetical CHAA portfolio. Stocks in each of these companies were “purchased” once high scores were determined. This mock portfolio was compared to a comparable S&P 500 portfolio. The CHAA portfolio had an annualized return of 13% more per year than the S&P. Here is a second study in which researchers evaluated a retrospective portfolio made up of cherry picked companies that shared one common characteristic — they all have very good wellness programs. In case you are wondering, a mutual fund portfolio or hedge fund that can consistently beat the S&P 500 by 13% per year is truly exceptional, about one in 10,000. For me the skeptical researcher and investor, here was another set of results using an entirely different research methodology with different experts, criteria, and scoring. The results of the Koop study were compelling but now there is a second study that corroborates the Koop findings. The combined results are harder to ignore. A third research study appears in the same journal. Once again, there were different authors, different methods, and a different research design. For years, the Health Enhancement Research Organization (HERO) has offered employers a chance to score the quality of their workplace wellness program by completing the HERO Scorecard. The scorecard is an online tool developed to help employers improve their employee wellness programs with a self-evaluation over six core areas. Scores from the 745 employers who completed the questionnaire from 2009 to 2012 were ranked from highest to lowest. Publicly-traded companies that had high scores were used to create another retrospective portfolio. In 11 of the 14 years evaluated, these companies outperformed a similar portfolio comprised of the S&P 500 companies. The HERO portfolio had annualized returns that exceeded the S&P returns by an average of 15% per year. Using the results from these three studies, a comparison can be made in the hypothetical returns on each portfolio. If you had invested $500 every month in each of the portfolios described here, you can see how your money would have grown. The companies that have award winning wellness programs consistently outperformed the S&P 500 companies by a huge margin. “Outperformed” might not even be strong enough. These portfolios smashed the S&P 500 portfolio. The annualized return of these hypothetical portfolios is greater then 99% of all actively managed mutual funds in existence today. Said another way, if you had selected a portfolio of stocks from companies with exceptional wellness programs, you would have enjoyed a return on investment greater than nearly every hotshot, Wall Street, stock picker in existence. Can Wellness Programs in the Workplace Really Explain This? For my entire career, I have been researching and studying the effects of workplace wellness programs. The wellness solutions we offer at WellSteps are based on this scientific evidence. We have known that workplace wellness programs can impact employee productivity, morale, recruitment, retention and other factors. But never did I think that an excellent wellness program could actually predict corporate financial success. Maybe it is a proxy measure of great management. That is good enough, because great management is what makes companies perform and great management is what makes sophisticated investors invest. Employers who are sufficiently capable and determined enough to develop excellent wellness programs, evaluate those programs, seriously reflect on the quality of their program, and/or apply for and win awards also understand how to manage their core business in such a way that revenues and profits will grow . . . which in turn causes the stock value to outperform the market. I’m proud to be part of a profession that transforms people’s lives and helps create successful, sustainable organizations. High quality workplace wellness programs exist in organizations that care deeply about their employees, their products and services, and the success of their organization. Excellent stock performance is one reason to start a wellness program. I might have to re-evaluate my retirement portfolio.